We hiked down into Havasu Canyon last week. You can see the travertine formations where Navajo Falls used to flow. You can also find other travertine formations where older waterfalls once flowed. This is a very dynamic place. A local news report claims there have been 14 significant flash floods in the past century. Each left its mark. 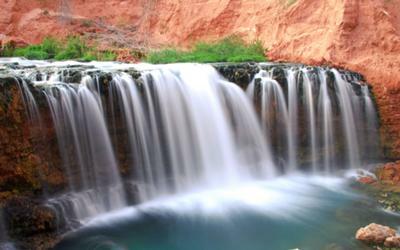 Of the two new falls, the upper one (sometimes called New Navajo Falls) is difficult to view from established trails. It looks like the best view is from the west side of the creek. I did not see an easy way to get there. On the day we left, we noticed a sign on the community bulletin board asking residents to nominate names for the new waterfall (the lower of the two). This one is easy to see.